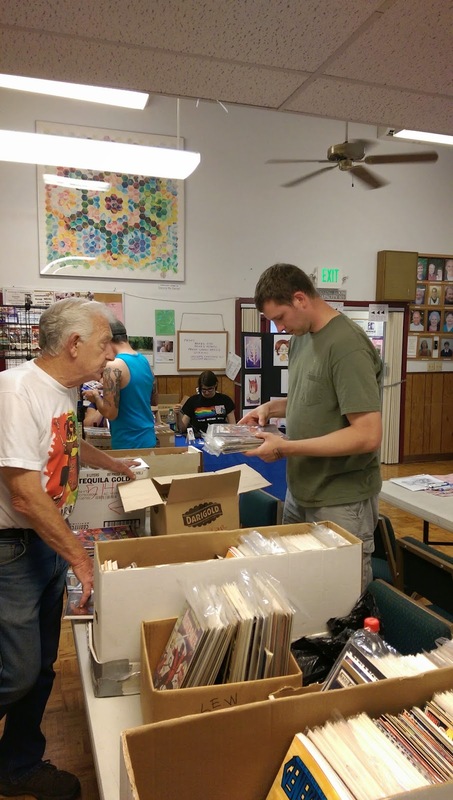 Comic Book Swap Meet and Rose City Comic Con review in photos!! Whoa, it's been a little while since I personally posted here at www.thestevestrout.com. 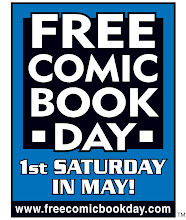 Hopefully you've all been enjoying the comic book reviews by Joe David Thompson, and the monthly cosplay column by Kit Cosplay! They would both love to hear your feedback, so feel free to drop them a line, send them a tweet, or talk to them on Facebook! Their contact info always follows their columns. 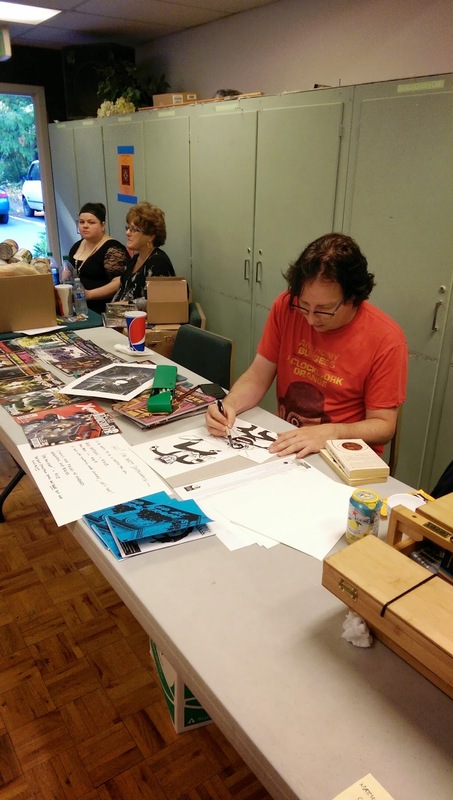 Indie comic artist John Campbell working on an awesome Wolverine piece! 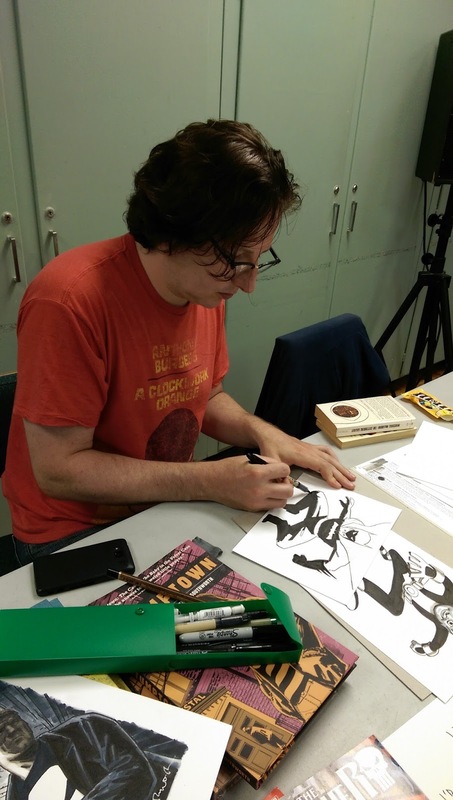 Keep your eyes open for an exciting comic project John is working on. 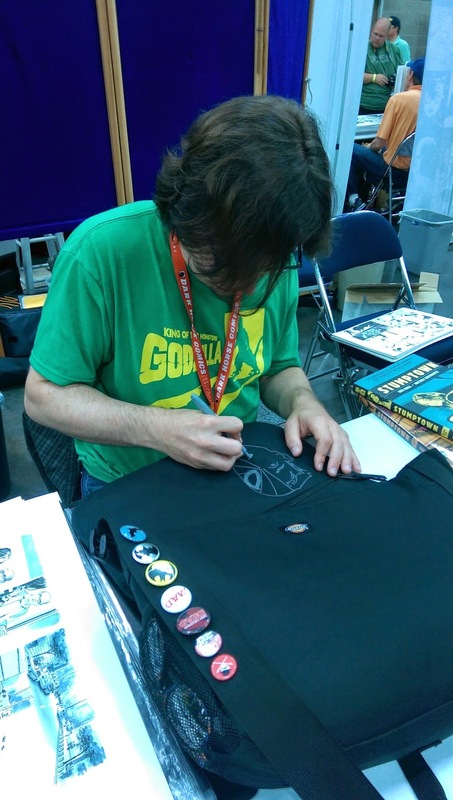 One of my favorite artists and good friend to www.thestevestrout.com, and the man behind the epic show flyer, Mr. CD Poe hard at work on a custom sketch for a fan. 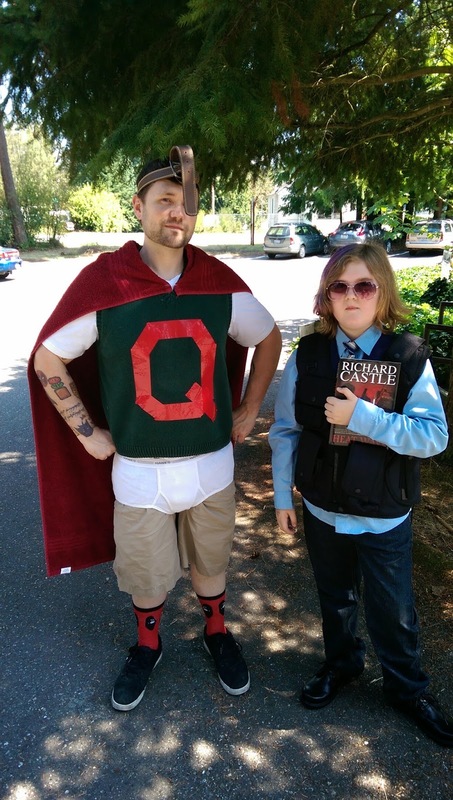 John Nutter's Quailman and one of my favorite people cosplaying as one of my favorite characters, Richard Castle!!! 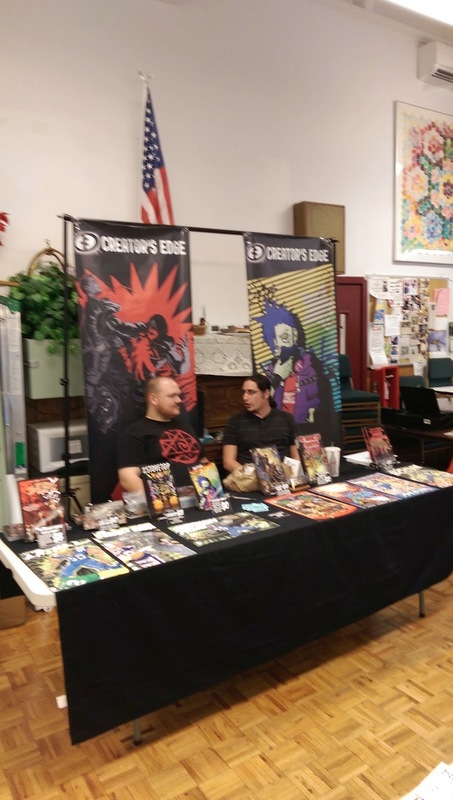 Comic Book Swap Meet guest of honor, Matthew Southworth. 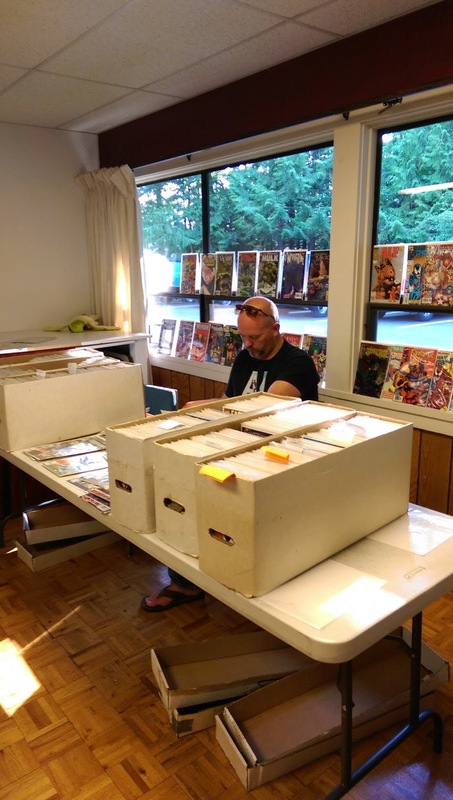 Matt has worked on some titles you might have heard of, such as Spider Man, X-Men, The Punisher, and recently on Stumptown! 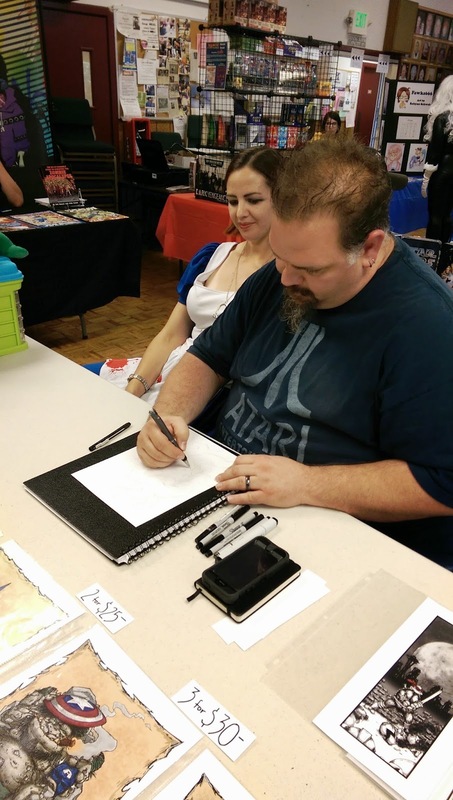 Matthew Southworth doing some beautiful sketches at the convention. A custom piece Matthew Southworth did for me!! 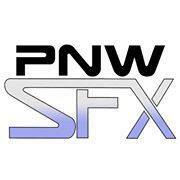 Watch out for a interview with Mr. Southworth in the near future. 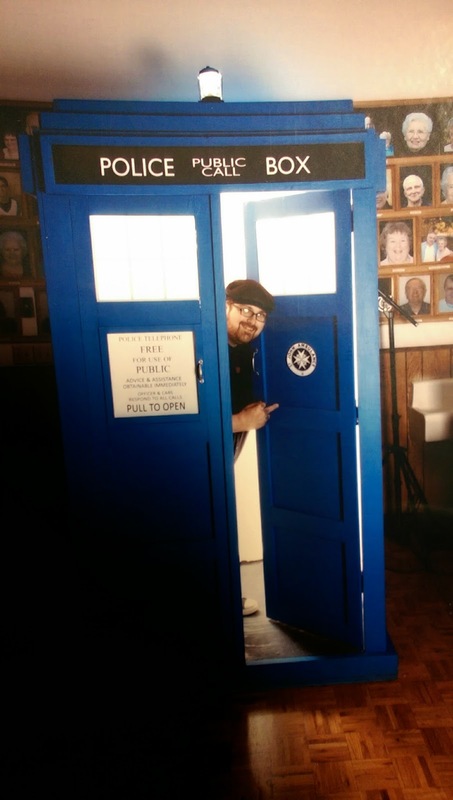 My nice way of saying bye to everyone at the mini-con! 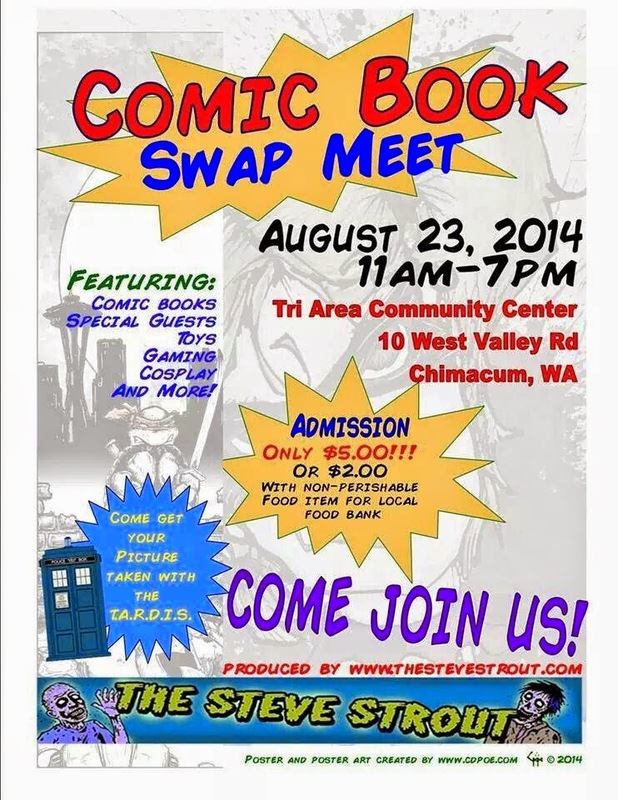 See ya next Comic Book Swap Meet! First and foremost I gotta give props to possibly my two favorite costumes of the show. Bombshell Wonder Woman and Bombshell Harley Quinn portrayed by my good friends Charlene Hartnett, making her cosplay debut, and up and comer Lauderdale Cosplay. Go follow Lauderdale on Facebook! She is serious about the art of cosplay. I had the chance to watch her work on these costumes and was very impressed by her hard work, determination, and craftsmanship to the point that I endorse her 100% in her career. I see big things for her. Now go follow her and tell her TheSteveStrout sent you! 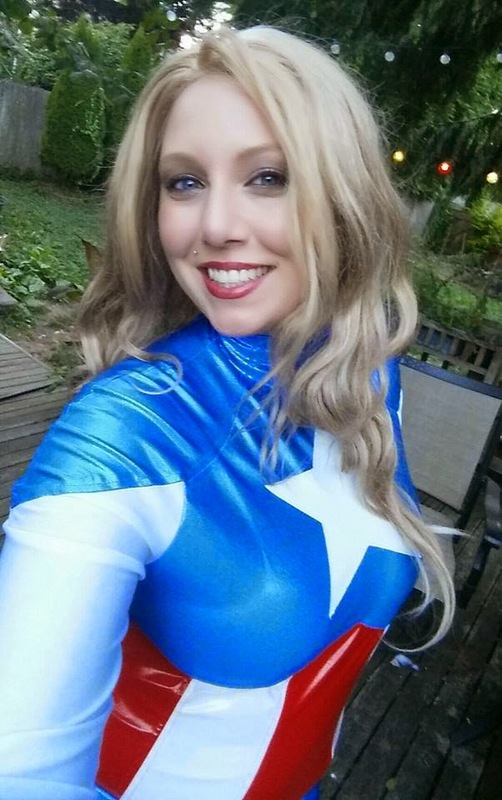 Remember the name Lauderdale Cosplay! 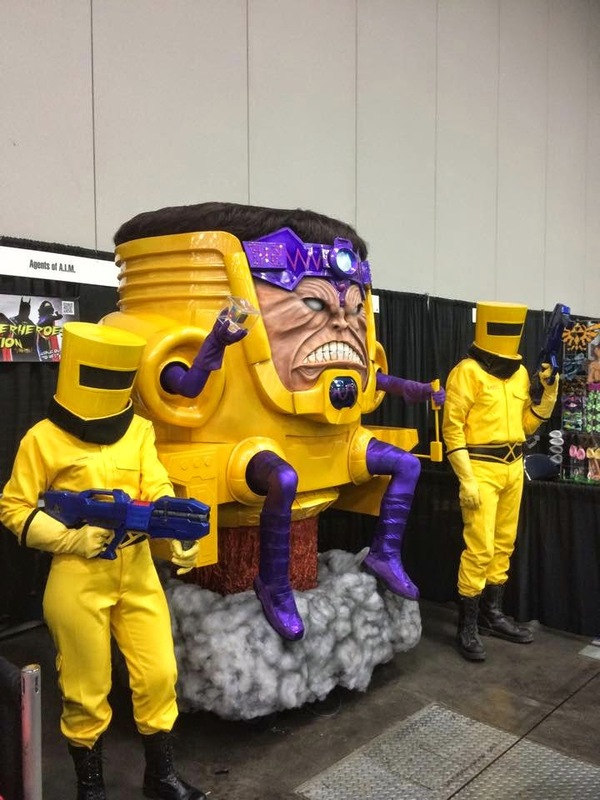 As a matter of fact, I want to give props to all my hardworking cosplay friends: Ryan Turney, Kit Cosplay, Abi Sue Cosplay, Jesse Lagers, John Nutter, and anyone else who gives their all for the art!! Got to meet the lovely Anne Wheaton and Bonnie Burton. They made me some custom Cards Against Humanity cards, which I will not share here (kids might be reading this!). Come play CAH and I will show ya! 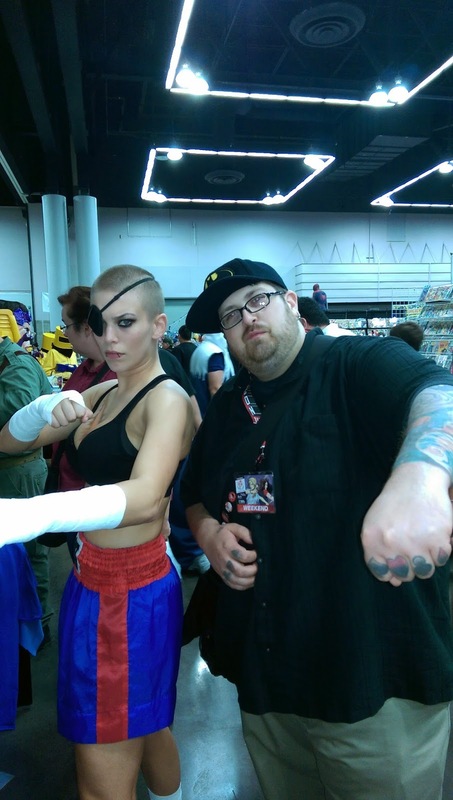 Hangin with one of the best up and coming cosplayers, Miss Sinister. Go check her out! 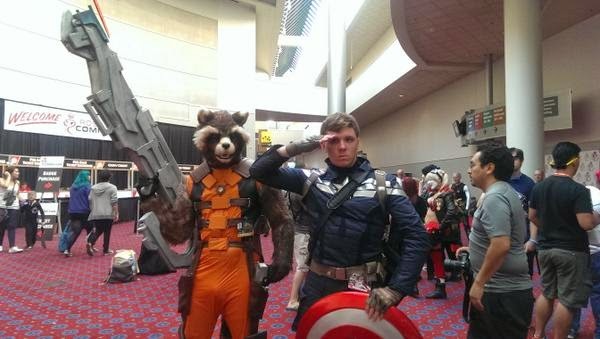 This Rocket Raccoon was in my top costumes of the show. This speaks for itself! Kneel before him. 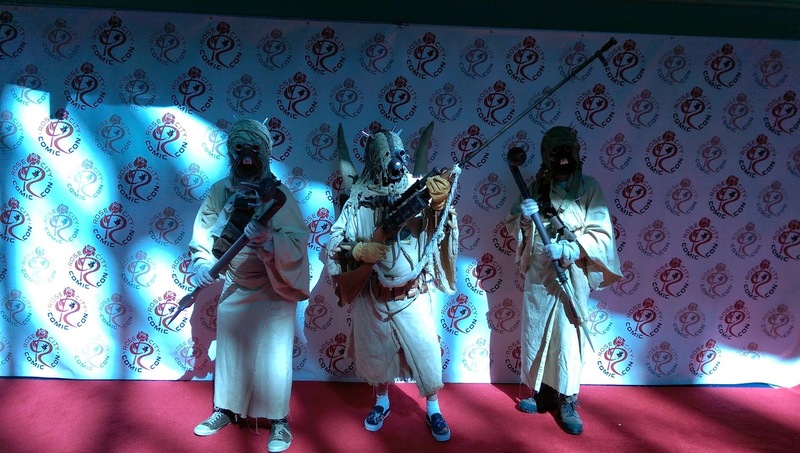 Bad picture of AWESOME Sand People...I dont care much for the lighting in the lobby at the Portland Convention Center. The glare makes taking a good photo really tricky. 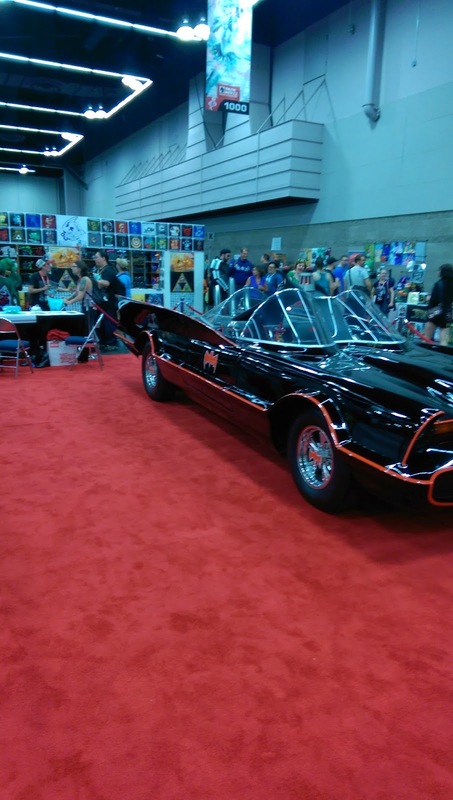 Classic Batmobile. A thing of beauty. 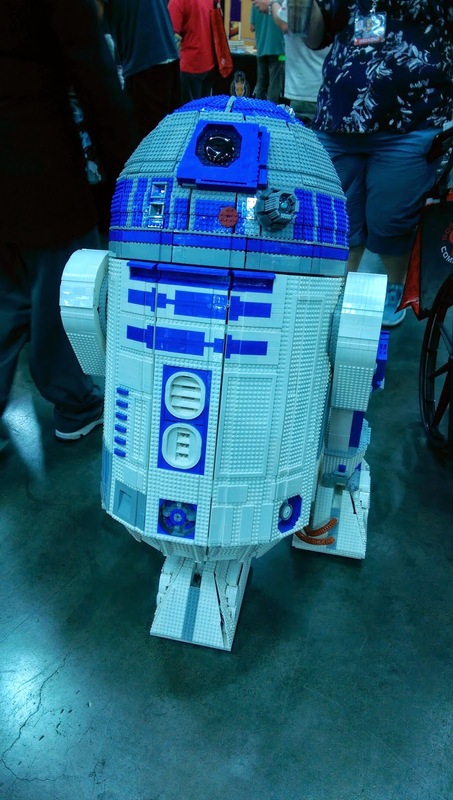 This Lego R2D2 was one of the coolest things I've ever seen! 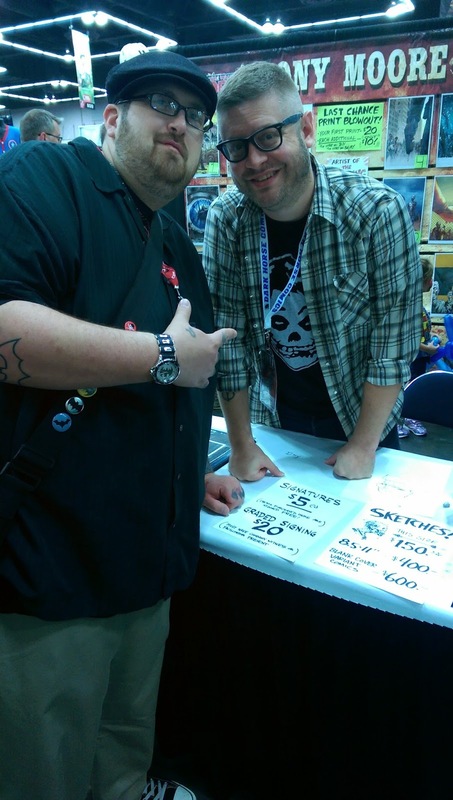 Me with the co-creator of the Walking Dead comics, and current Deadpool artist, Tony Moore! 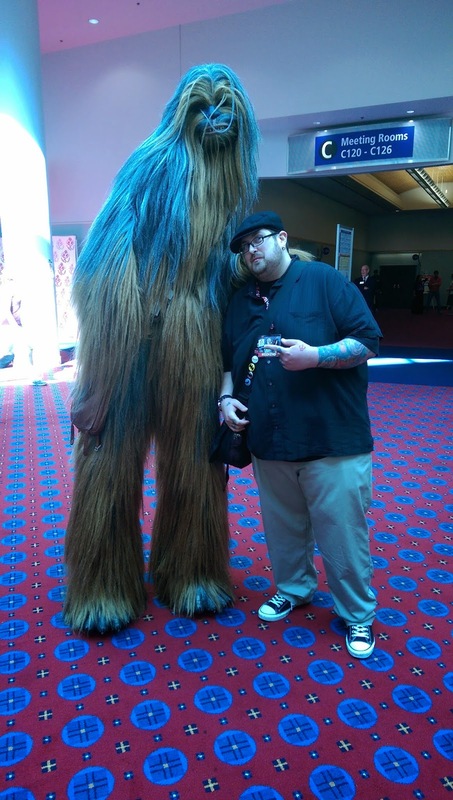 I high fived this Wookie! 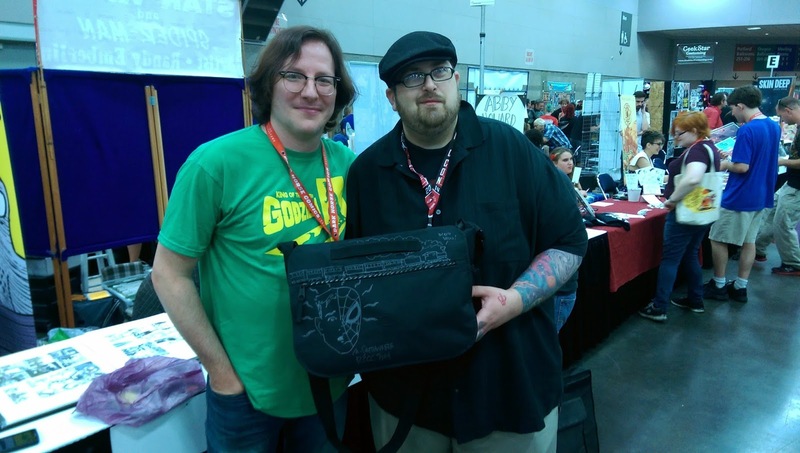 My friend and Stumptown artist, Matthew Southworth, Doing a sketch on my bag at RCCC! Matt and I with the bag! Such an amazing talent and nice guy. 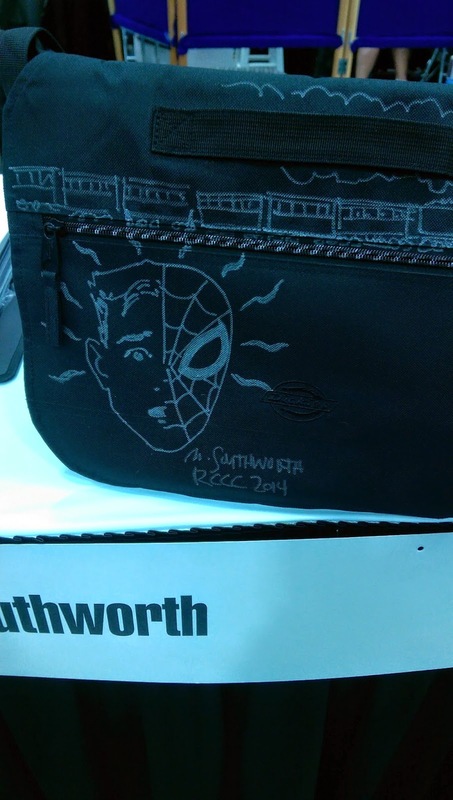 Close-up of the bag. Spidey/Peter Parker! If you run into me in person, check it out! Fantastic Ronen cosplay. If you know who this was let me know! 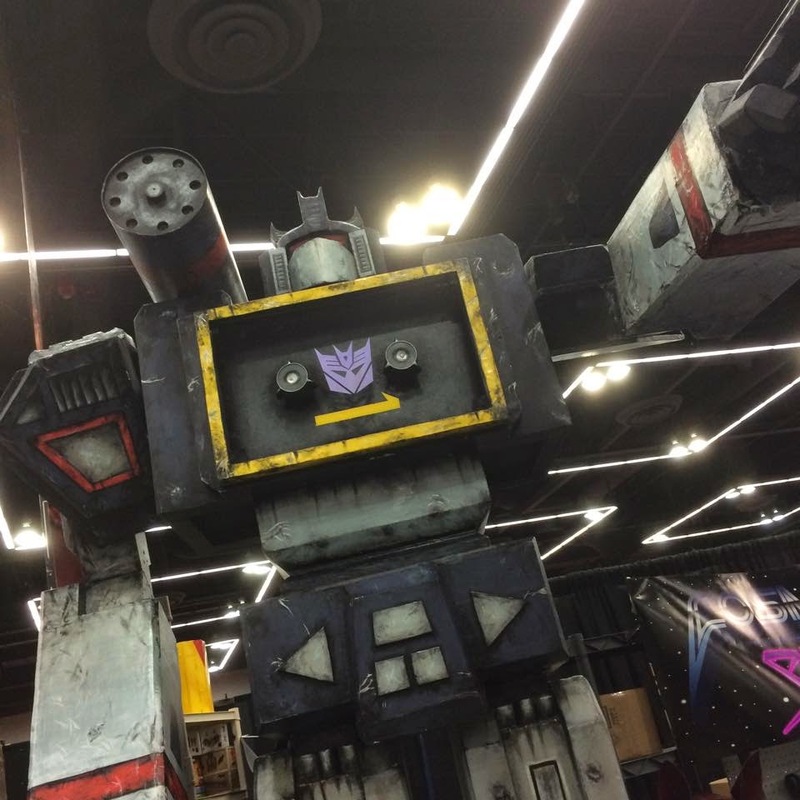 Huge Soundwave at the Bobakahn Toys booth! 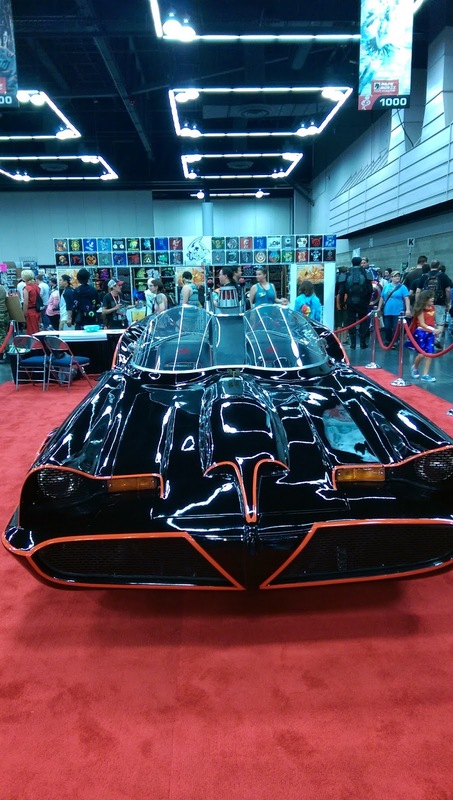 I saw this the last couple years at Emerald City Comic Con and it never ceases to blow my mind! As always, thanks for viewing! 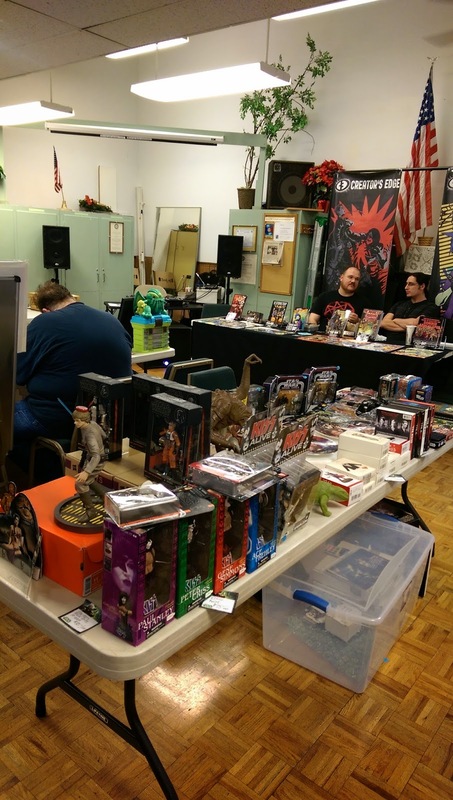 Be sure to join us on Facebook in our Comic Book Swap Meet group and official Comic Book Swap Meet Page to follow the latest nerdy news and talk, and stay updated on the upcoming Comic Book Swap Meet Events. You can follow on Instagram as well at http://instagram.com/thestevestrout. If combining the sensibilities of the sci fi classic War of the Worlds with the aesthetic of The Fantastic Mr. Fox sounds appealing, then you're going to love my favorite book of this past week, Wild's End. 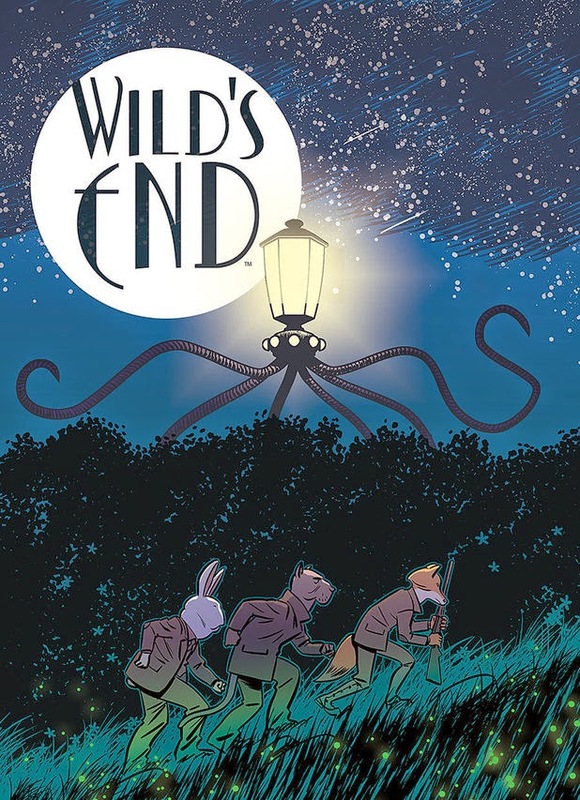 Wild's End is the latest miniseries from acclaimed comic writer Dan Abnett (the mastermind of Guardians of the Galaxy), bringing us some very British talking animals living a quaint life in the English countryside, only to have their quiet life torn asunder with the arrival (invasion?) 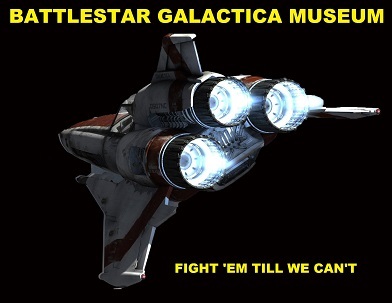 of an alien craft. Maybe on paper it sounds like something completely predictable, but what makes Wild's End so enjoyable is its charm and humor. Abnett brings us some wonderful characters, whether it's Fawkes, the town drunk and a fox, Gilbert the rabbit and town solicitor, or Peter the reporter. We even get the haunted Mr. Slipaway, a dog troubled by his time in the military. It all gels into a portrait of a life soon to be faced with trouble. Boom Studios describes the interplay of characters as recalling Edgar Wright and Simon Pegg's Cornetto Trilogy, and their not far off at that. 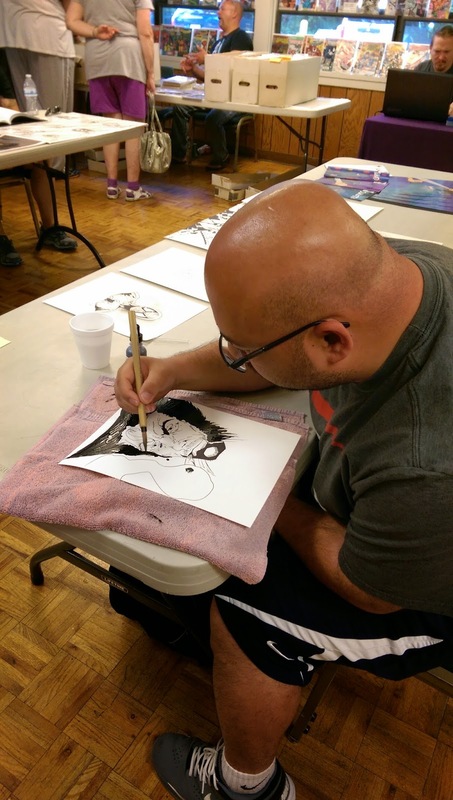 Artist INJ Culbard delivers some goregous art. Most notable in his pages is how he captures the emotions of the text, all on the faces of talking animals. No small feat indeed. What could end up more cartoonish is actually quite grounded and wonderful. On a personal note: I just wanted to thank Steve for his patience during my absence over the past weeks. 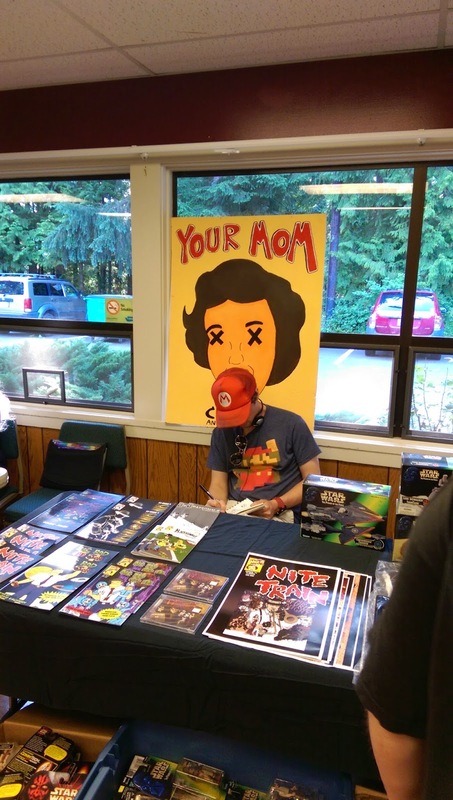 My mother passed away suddenly, and while I'm still dealing with miscellaneous family matters, it's good to be back on the comic review beat. 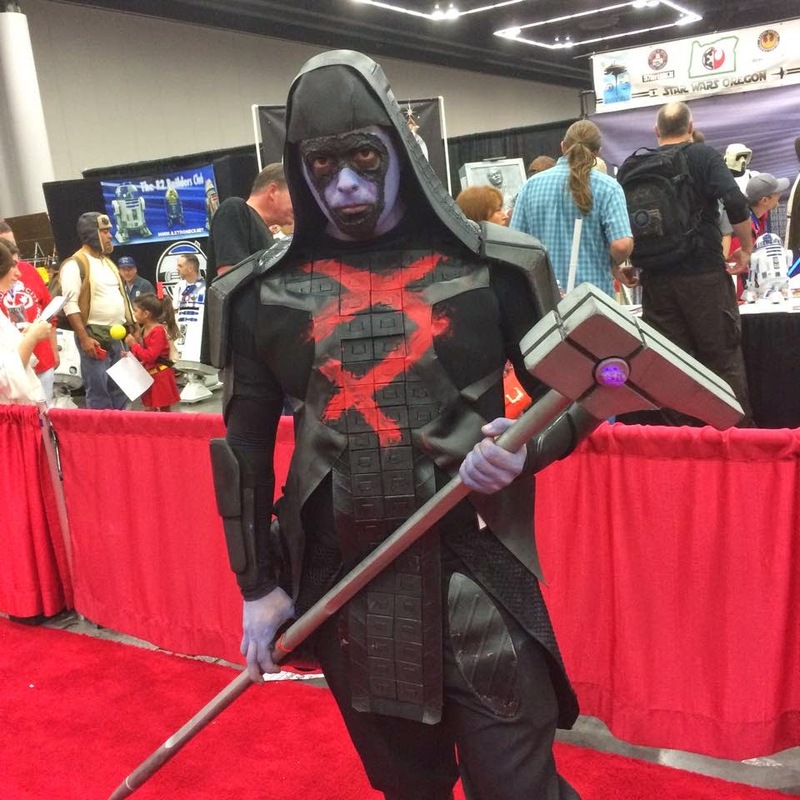 Cosplay Talk with Kit Cosplay: Pax Review!! 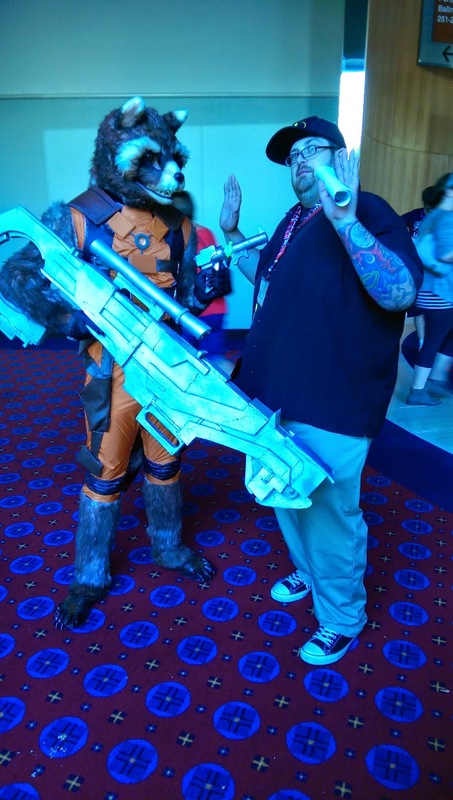 I had the pleasure of attending PAX Prime this past weekend, and I had a blast! 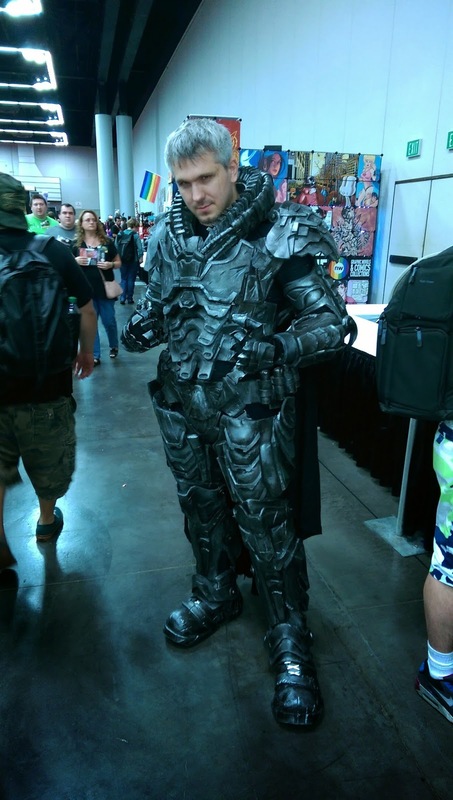 The cosplay completely blew me away. 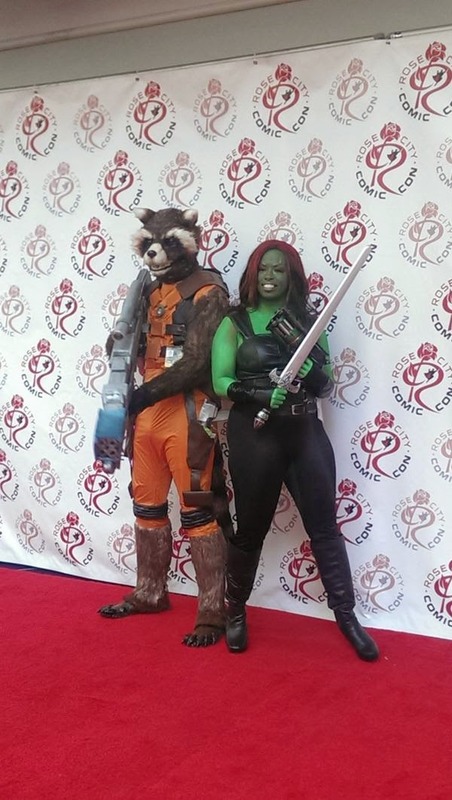 The caliber of creativity and quality was readily apparent in every costume I saw. I had a hard time picking out my favorites, but here are a few that I thought were pretty fantastic. the perfect draping of the fabric, and the detail painting in her props. Her favorite part of cosplaying is being able to become the character that she loves. She mentioned that the worst part of cosplaying over PAX weekend was the fact that it rained on Saturday, and let me tell you, water and costumes rarely mix well. 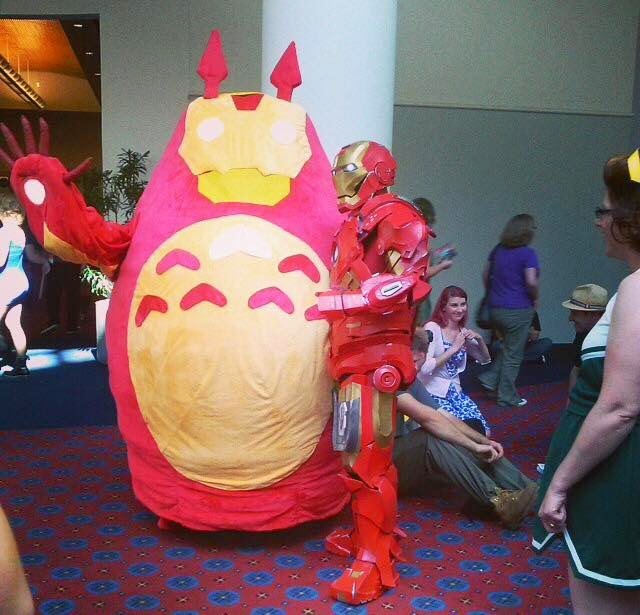 Thankfully, her costume survived the rain, and she was back on Sunday to enjoy the rest of the convention. You can find more of Rebekah’s creations on Facebook via SwanMay’s Reliquary. The next couple of costumes I really liked were actually reps from Amazon Game Studios. They were cosplaying Boom Boom Mary and Elliot from Saber’s Edge. Jordan, who was in the Boom Boom Mary costume, said that she really enjoyed interacting with the fans of the game. Elliot was really excited about his costume, as he mentioned that it had gotten him into a party the night previous. 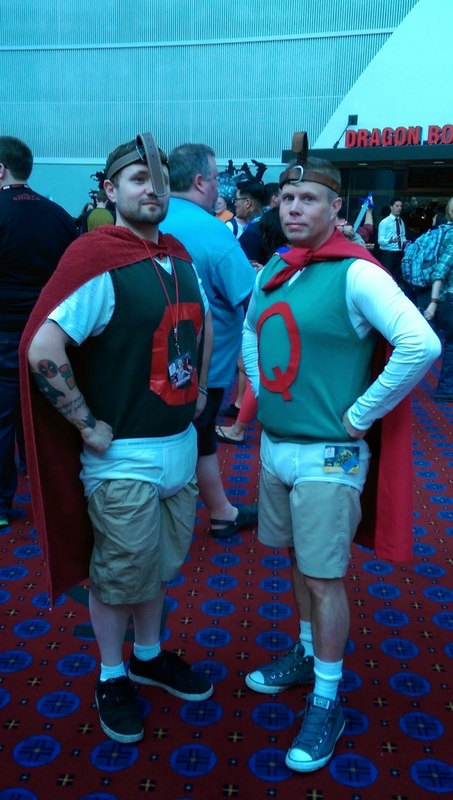 Cosplay: your ticket in! Check out more of Elliot’s costumes on Facebook, where he regularly partners up with his girlfriend to do fantastic couple cosplays! This next group… Gosh, I have no words for this. This Archer group is just awesome. Lastly, I have to give a shout-out to Meris. I helped her with her armor, and her whole costume turned out looking spectacular. She is cosplaying Leliana from the upcoming game Dragon Age: Inquisition. She said that she loved meeting the Bioware folks who work on DA, who were equally impressed with her level of detail and craftsmanship. 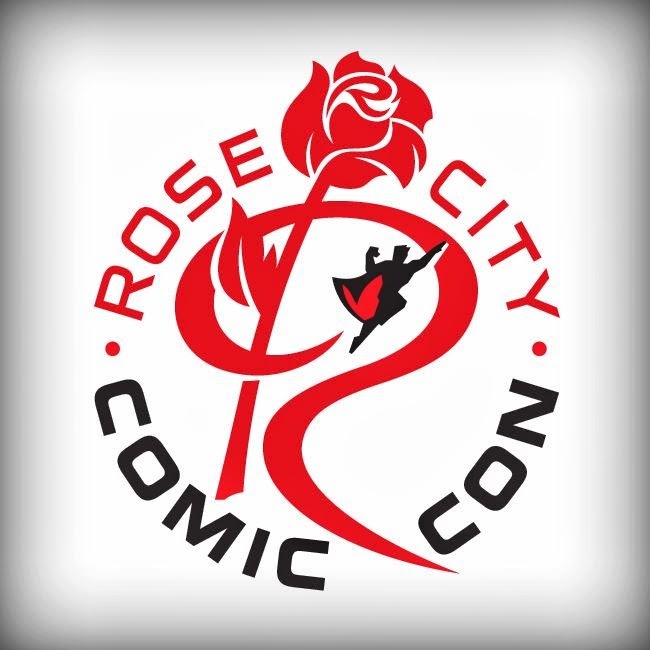 I went in civvies for PAX, but I am currently working on an American Dream costume, which I’ll fully debut at Rose City Comic Con. 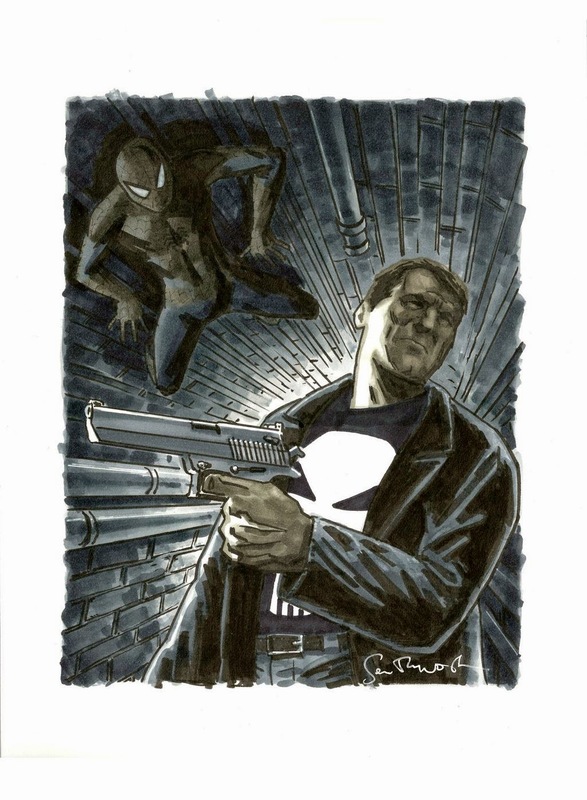 Below is a sneak-peek – Thanks for reading!